Having started on a new project, breeding Albino Full Red Guppy, I researched online to find other forms of food that I can feed the frys that I will have in future. I know I could just feed them commercial food like flakes and pound them to powder to feed. And there's always the boiled egg yolk. I wanted something live. Something small that can feed a frys mouth. That was when I stumble upon microworms. Scientifically known as Panagrellus Redivivus. Thanks to Stan aka Wongce (Aquatic Quotient) who alerted me to a fellow member who was selling the microworms. I sent a message to HappyGuppies via Whatapps and was glad that he had some to sell off to me. It was $5 for a package. He sold two tubs of the culture and some other stuffs like oatmeals. I was caught off guard as it seems a lot. I only expected to get the two tubs only. It's difficult to see these worms but if you look closely, they shimmer as they are constanly moving. They are really tiny! Anyway, having learn a few things from HappyGuppies own way of culturing and checking online for guidance, I did my own using the culture sold to me by HappyGuppies. So here is my version. It's not difficult at all and it ain't rocket science either. Let's start with what we need. Get a small container such as the one shown in the picture. Don't get a container that is shallow. The worms will be climbing the sides of the container and that's where you will harvest them. Now, reading online, some "microworm rancher" cook their oatmeals. This is not necessary at all. I'm not certain of the purpose. Just use any ordinary oatmeal. By the way, there are other 'ranchers' that uses baby cereal. You can use that as well. But pour more water as those baby food will absorb a lot of water. Just enough to make a paste. Optional. It is not necessary at all. You may if you want. Just a tiny pinch will do. 1) Take the cover and using whatever sharp object you have, make tiny holes on the container cover. The worms do need oxygen. Do not leave it open or else it gets contaminated. Meaning, you might get maggots in your culture as well. Another method is to make a big hole and use a netting to cover. Aluminium foil as a cover works fine too. 2) Pour your oatmeal in and add water. How much oatmeal? Up to you.If you check the pictures, mine is about 1/5th of the container in height. Stir and make a paste. 3) Scoop the top portion of an existing culture. Don't dig in with the spoon. Just the top layer. That's where the worms are. Put the culture on top of your oatmeal paste. There's no need to stir it. 4) Optional: add a small pinch of yeast. 5) Place your cover and wait. The worms will start to climb the side of your container. That's when you harvest. Using a toothpick or cotton swap, take a little bit from the side. Two methods that you can do is to put into a small container of water. Use a pippette and feed the frys. Or the norm, just dip the toothpick or cotton swap into the tank with frys. Temperature: 80 degrees Farenheit. Err...my room temperature is 86 degrees Farenheit. It's not "die-die" must be 80 Farenheit which is about 26 Degrees Celcius. So this portion doesn't matter much to me. I'm not living in Antartica or Sahara Desert. Medium: The medium use often is oatmeal. Then baby cereal and the most uncommon one is bread. Sub-Culturing: It is best to have a new culture started in 2-3 weeks time from the last. Just add the old culture to the new medium. The worms takes care of the rest. Lifespan: Interestingly enough, this worm live 20-25 days. After 3rd day of their life they reproduce and bearing about 40 worms a day! Do note, if the top portion of your culture starts to become watery and brown, start a new culture. If you are using yeast which is really not necessary, make sure the "air holes" you made are plenty as the carbon dioxide produce will kill them instead. Well, that' about it. Not difficult isn't it. Oh one thing I like to say is, regardless new or a culture that is crashing, man it stinks! 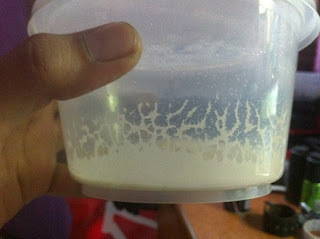 Yeasty smell; sour kind smell. Crap, I don't even know how to explain that "exotic" smell. PS: If you are looking to purchase a culture, please go to Aquatic Quotient and look for HappyGuppies. Nice chap.